When we arrive we will assess the furniture and determine the type of leather and which process will work safely and most effectively. We then apply a cleaner that will break up the dirt and oils on the leather. We will then gently agitate the surface of the leather and remove dirt and oils with a terry cloth pad leaving a clean dry surface. To leave your furniture protected, we apply a conditioner that replenishes the natural oils in your furniture leaving it soft and flexible. Everyone can appreciate the look and feel of leather, and with the proper maintenance you can enjoy fine leather for many years to come. Many people have little knowledge of how to care for leather. Like any other material leather needs to be cared for, cleaned, and repaired to be kept in good condition. But most important, the proper types of products must be used to maintain the natural beauty of leather. Unfortunately, with the array of products available it is difficult to choose an effective product. Many products are only mediocre or do more harm than good. Trust Absolute Carpet Care to ensure the quality of your fine leather for years to come. All leather comes from one source, the hides of animals. Different animal skins are used to produce a variety of looks in leather. The most common comes from cows. All leathers are processed in similar manners to achieve the look and feel of a particular purpose. Once the leather is tanned and processed, certain sections are then selected for use on a particular application. This process determines the type of leather that will be made available to you. In almost all situations, similar tanning and dyeing chemicals and processes are used. Many different types of leather are used. The most common, Top Grain (coated) leather is used in almost all automotive and furniture upholstery. This type of leather is the most durable and easiest to maintain. Aniline (Nubuck) is a form of leather with a very soft feeling. Usually there is no finish, leaving it unsealed and susceptible to dirt and staining. Suede is a form of this leather. Regular cleaning and replenishment of natural oils, will keep the leather in good condition for a very long time. Oils in the leather will dry out and evaporate even when the leather is not regularly used. To keep the leather soft and flexible, dirt and grime which have accumulated on the surface must be removed, and the oils be periodically replaced. No matter how carefully you protect your leather, spills and other accidents can cause potential problems. Many stains can be easily removed if corrected immediately using the proper product. In most cases, home remedies that are tried only succeed in setting the stain in deeper, making it impossible to remove. It’s important that stains be treated properly from the start. Q. Do I need to do anything to maintain my leather furniture if it doesn’t appear dirty? A. 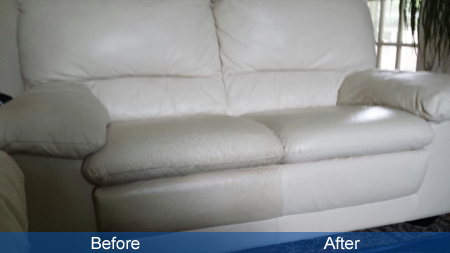 Absolute Carpet Care recommends cleaning and conditioning your leather every year or year and a half. Oils in your leather dry out and evaporate even when your leather is rarely used. It is important to replenish these oils as well as occasionally clean the leather to protect it for years to come. Q. Will your process work on my car interior, as well as my leather furniture? A. Yes, leather interiors in automobiles take a lot of abuse from sun, water, and dirt. Absolute Carpet Care’s cleaning and conditioning process will help your interior last as long as your car.